"Extremely pleasant, polite and trustworth. Honest, great value for money, job delivered on time as agreed. Will definitely use Paul again and recommend you use him and his team." "I cannot thank Paul enough for his efficiency,speedy response and excellent work which went over and above what he had priced for! in this day and age this is a rarity so please do not hesitate to employ him!!" "I was very impressed with the work Infinity undertook for us - they did a great job, left my garden spotless and were extremely polite and punctual. I've since recommended them to my in-laws!" "This is the second time Paul has completed work for us. He is a great guy, professional and has a real eye for detail. The thing that stands out is that he takes time to listen to your ideas (he visited us several times to make sure we had got the plan right) and he makes suggestions based on his experience and he is always right! The result looks fantastic - we would definitely use Paul again and would recommend him to anyone." "Excellent service received, prompt and trustworthy, quality wood used in replacing a complete fence. I would high recommend." "I am extremely happy with the recent garden work. From the very first contact with Infinity, I was impressed and the work was completed to an exceptional standard. It was pleasure to having the team working at my house. I would definitely recommend them to anybody in the future."" "I would not hesitate to recommend Paul and his team! They completed the work to a exceptionally high level of workmanship. I was confident in their knowledgeable approach and they demonstrated fantastic problem solving abilities. Every member of the team was so friendly and they always went the extra mile. Will use again! " 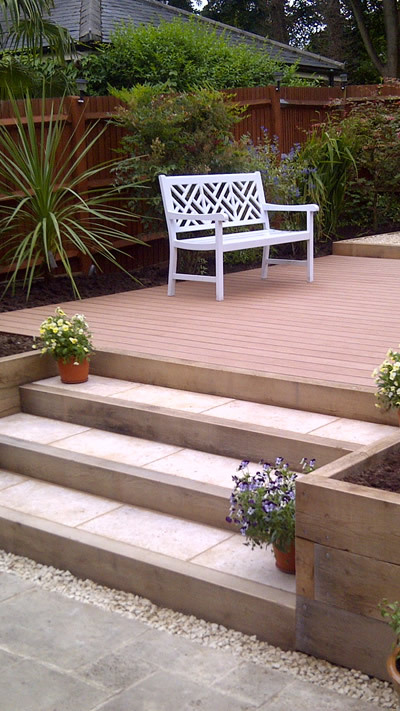 "We love our new garden decking. It was laid quickly and to a very high standard. Despite our budget, Paul and his team managed to find a solution that allowed for us to enjoy our Pimms in the garden this summer! Thank you so much!" "The team performed an excellent rescue job on our garden. Our lawn was in a terrible state and we really thought this would cost the earth! Infintity provided exceptional value for money and our new lawn is the envy of our neighbours! Thank you for all your work, truly recommended professionals!"